No one is perfect. Each and every person has some good qualities and some bad qualities in them. Some has more of the good and less of the bad, other have the other way around. What it boils down to is that sometimes you see some person doing something you dislike. You know the person has so much potential and can really do a lot better than that, all he/she needs is a little guidance from some brother or sister. Than you need to talk to that person somehow. 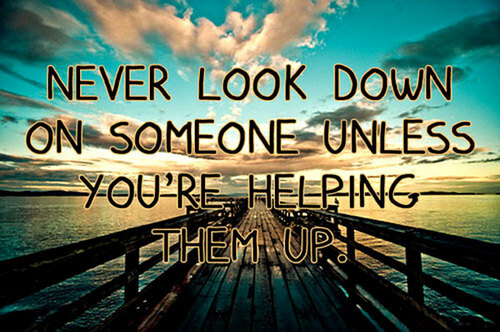 If you can and you want to help, you should of course give it a try, but only with the right intention backing you up. If for instance you are correcting someone just to show your own superiority over that person, in a way you are saying, you have these and these faults, I am so much better that you, do that like this or that, it most probably won`t help that person. You cannot look down on other people you want to correct. If you do that, and they find out, by the attitude you are dealing with them, they most probably won`t listen to you. You need to in some way let them understand that you are here to help, because they have so much potential, if it is used right, can move mountains. A lot of us may sometimes need a push in the right direction from time to time. You need to fill them with positive boost, once in a while. That can make them see that even one voice can make a difference. One thing is for sure, if you don`t have the right intention of helping and are looking for personal gain, than the intention is what will either count it as a good deed or not. If you sincerely want to help, than let other people whom may be down see that they are human beings with a lot of worth and good values but haven`t gotten the right push from their surroundings so that they also can blossom and become a rose. They need to develop a sence of self-worth. That their opinions are important and that they can make a difference. Another important thing is that you cannot correct a person in public. If you do that the person most probably won`t listen to you ever again. Whenever you want to correct someone respect them, do it privately, so that they don`t feel that you are telling the whole world about their faults. There is not a person out there whom doesn`t have some good and bad characteristics in them.This is something people learn from a very young age. That when their parents want to correct them they don`t do it in front of guests. Or that your spouse doesn`t correct you in front of their family. Or that your friends don`t talk ill of you in front of others. Especially when they think they are behaving funny. No one can have fun on some others extent. That is wrong. Don`t laugh at someone but rather laugh with someone. One more thing is that sometimes the young generation might want to correct an elder, how should one do that? One should try to speak in a way that, you tell the person a positive thing about them and then a less positive, so it balances up. If you always come with the negative and never say anything positive than the balance would be rather negative and the person would become upset. There is not one person out there whom doesn`t have anything good about them. We and I`m counting in myself, need to become better in finding the positive things in people when we talk to them. People with positive surroundings may not find this that difficult, so they have a bigger responsibility to share the positivism more. They will only gain in this. Because it`s always like this that what you give to other you get back one way or the other, if you spread positivity than that would come back to you one day, inshaAllah ameen. Let`s join in hands to single out the faults and spread positivity and try to lit up a sad soul, that needs someone to talk to, without bringing them down. It`s not always the youth that need this the most, sometimes it could also be some of the elders in the family as well.